A few weeks ago, some of you may remember that Capcom released a new Ultra Street Fighter II trailer which seemed to include footage of some kind of new first person fighting mode. No more details were forthcoming, but the idea seemed to fit well with the Joy-Con controllers that the Switch will be sporting. Now, a picture has come out online of the Japanese box art for the game, and it confirms that there will indeed be a first-person mode. 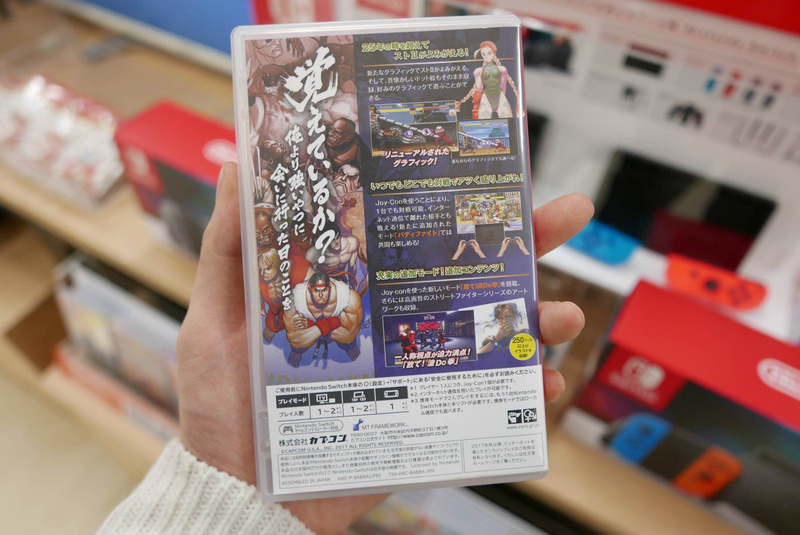 Details are still scarce, as Capcom still hasn't announced anything about the new mode, but the box art calls it "Unleash! Hadoken" with the "do" in the latter word being emphasized due to how motion controls will allow you to throw the fireballs yourself. The screenshot included on the back shows a timer and several enemy characters, too, which suggests that it'll perhaps be some kind of target shoot mode. What do you think? Will you be picking this up? Do you think this new mode sounds interesting? Drop us a comment in the section below. First person view of Hadouken ? I'm getting this no matter what. Nostalgia rules! Def interesting. This game is high on my day-one list. Wish it was a launch title. I've never play SF2, so this'll be my first go. Looks great so far. So if it is in first person and you can shoot fireballs then technically it's a FPS. @MitchVogel Its been on the Virtual Console for years. Why have you passed those up? The box art from the back looks quite snazzy, might pick this up along with the Switch when it comes out. SF II was one of my favorite games as a kid. I wouldn't rest until I beat story mode with every fighter then I took to the arcade to duke it out. I'll be grabbing this to play in between Breath of the wild binges. At this time and age, I just don't get why the Nintendo Switch game would need that big of a case. I mean all it has in there is the game card, it's likely any physical copy would come with a manual anymore so why make a big disc style case. Just make it small like the PS Vita or heck even smaller. I hope that this will be sensibly priced as a retail release. I hope they don't take a leaf from Konami's pricing book and see fit to charge $70-$90 for this. I can currently grab the PC version of Street Fighter V for under $30. so do you shoot the fireball with a joystick+button combo, or do you do the actual motion with the joycons? coz i'm game for that, and i would PAY to see someone put joycons on their ankles to do chun li's spinning bird kick. I can't imagine the 1st person mode being much more than a novelty mini game you'll play a handful of times before forgetting about.I hope I'm wrong though.Regardless,hugely looking forward to this. @retro_player_22 I think it's to make the games stand out among the rest plus it fits with it's hybrid image.Smaller than a home console case but larger than a handheld case.It wouldn't look like a good alternative to PS/Xbox if they were packaged in a 3DS sized case. @Bass_X0 It's one of those games that's on the list, but it's never a priority. I've played Street Fighter games, but just never got around to this one. Looks like the best version yet tho! @retro_player_22 : I would have preferred the cases to be the same size as the DS/3DS game cases. 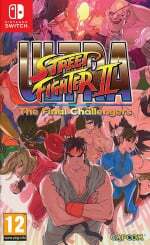 Ultra SF 2 is getting a physical release? I can't imagine the first person mode will be anything but a limited mini game, considering the lack of 3d graphics & engine for the main game. But it could certainly be a fun distraction. I'll just be standing in front of the TV with 2 joy-cons in my hands, swing my arms wild yelling "HADOKEN!, HADOKEN!, HADOKEN!" like a boss. This sounds like a mini game where you mimic the "hadouken" movement, it's not Street Fighter in "first person mode". I planned on getting this game when it was revealed. I hope The Switch we get a new Street Fighter game in the future. @OorWullie That's my thinking as well. They don't want people to think that Switch games aren't home console games. Can you imagine Spinning Bird Kick in first person 3D? I think people are going to either hurl, faint or feel dizzy for a while! @retro_player_22 That is the same damn fn thing I said. It would have been way better to get the size just like the 3ds. But now with the way it looks, Sony fans are screaming PSP box art rip off. The fact that they have barely showed this mode presumably means it's a mini game. Which is fine, but would not justify a full RRP. Oh, I will use Cammy to avoid Hadouken with SPIRAL ARROW !! And don't forget her SPINDRIVE SMASHER!! At least there will be one street fighter in a Nintendo console even if it's only street fighter 2. Only problem is you will need a pro controller for this. I was hoping the game would be on cartridge. I'd rather that. I still don't get why a 20 year old game is getting a full priced re-release for Switch. @retro_player_22 It's to emphasize that the Switch is a home console first. A smaller box size would imply that it's a portable which is not the marketing direction Nintendo wants to take with the Switch. Cool, but the "Dragon Ball Z: Budokai Tenkaichi" sub-series on Wii already did this years ago (and did it very well), so no points for originality. @Einherjar I think they are using a stripped down version of the SFV engine in order to pull that off. However, I'm not sure of the deal Sony has with Capcom for it being PS4 exclusive so I'm not even sure about that. @Wexter But wouldnt that mean that they had to include every characters 3D model anyways ? So why not give it a fresh lick of paint entirely and make it 3D by default ? Thats nice but what does the front of the box look like? Won't be getting a Switch until the holidays at the earliest, so I hope this game does well and makes its way to PS4 or Xbox One asap. Wipe away the stain on the franchise that is SF V.
Sadly that 20-year-old game is still worth more $$$ than 99% of fighting games today. In fact, I can't think of one for the current consoles that is better than SF II. It sounds nothing more than the intro scene of Super Street Fighter II and SSFII Turbo. Seems odd, I would think the majority of development time for this game is spend in that mode, but it's not even being advertised as of now. I am hyped for USF2 and more modes n features the better . Patiently waiting on a release date.